Wednesday Word started off gangbusters with fifteen to twenty other bloggers linking weekly. After trying to stay on top of writing a weekly Wednesday Word post and reading the articles of all the linkers, I became overwhelmed and my blog suffered – I no longer took the time to write about some of the fun things that I had in the past. Eventually, I shifted Wednesday Word to a monthly linkup, but it just wasn’t the same. Not surprisingly, the less frequent linkup resulted in Wednesday Word becoming an afterthought for some of the regulars and it lost its popularity. I still felt the burden of writing a monthly post on a word that I’d selected without a preplanned angle in mind (I wanted to keep it on a fair playing field with my linkers). The excitement eventually waned and my once fun linkup became a thorn in my side and I often wished that I had the option to skip the linkup. My poor husband heard me complain more than enough times that I had to stay up late to finish writing my Wednesday Word post the night before it was scheduled to go live. 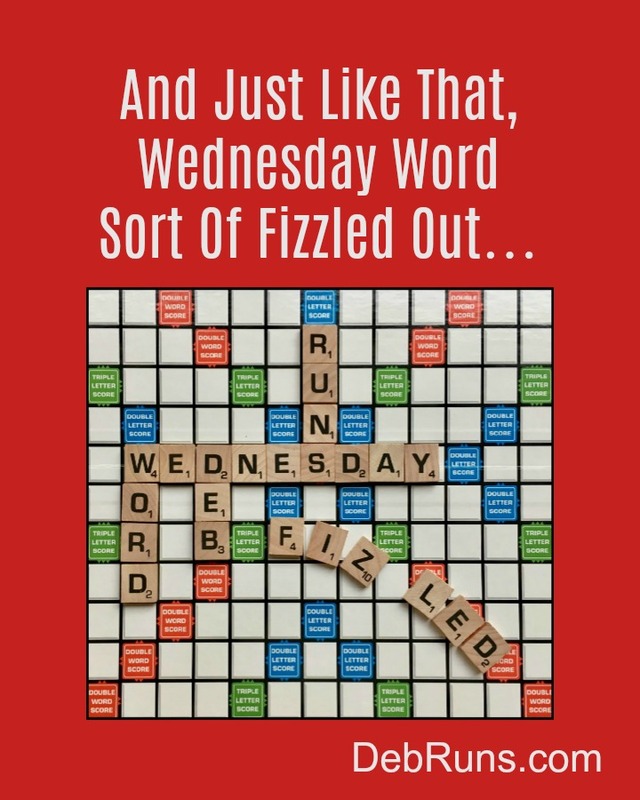 Over the course of this summer, I considered ending the Wednesday Word linkup at the end of the year, but this past weekend as I thought about my angle using the word fizzle, I realized the stars had aligned and the time was now to end the linkup. You’ll notice on the Wednesday Word page, I’ve deleted all future words, and with that, Wednesday Word is no more. It’s on a hiatus and time will tell whether it’s temporary or permanent. Of course, it wouldn’t be right to close this small chapter of Deb Runs without thanking all of my friends, both virtual and in real life, who have linked up over the last two years. You entertained me with such a wide variety of creative takes on each week’s/month’s word and I thank you! What have you attempted that fizzled out? Grab My Button! It’s not too late to link up on this final Wednesday Word, and if you do, please remember to follow my four simple rules. A 5K World Record, Cracking My Cooktop, And Isn’t It Supposed To Be Fall? When I was blogging….I loved WW!! I can totally understand how things fizzle….as my blog did. It too became a bit overwhelming. Awww, thank you, Tamieka! I always enjoyed reading your posts and I remember how you often said that it seemed like I read your mind when I selected the words. Hope you and your family are doing well! Even though I have missed a few lately (or forgotten to link up), I will also miss the WW! It made me think — this month’s word was no different! — and I love something that challenges me. I am absolutely sorry to see it go, but I also understand.